In the grounds of a picturesque chateau in sunny rural France lie six charming gites, luxurious and comfortable yet rustic and traditional. 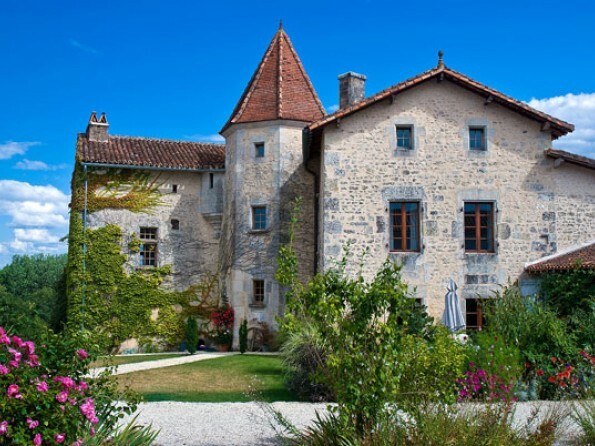 If you’re on the hunt for child-friendly holiday accommodation in a peaceful and scenic location then Chateau de Gurat could be just the place. 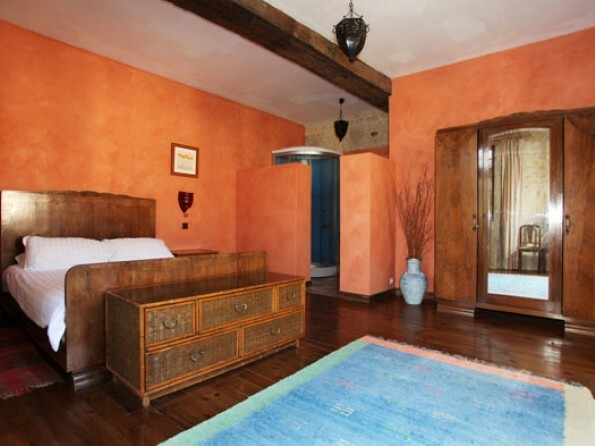 The chateau is situated on the edge of the tranquil little village of Gurat and dates back to the 15th century. And within the expansive grounds you will find six cottages, all of which have been carefully renovated and thoughtfully furnished. Original oak beams and stonework retain an old-style French countryside character, but modern kitchens, Egyptian cotton bedding and welcome hampers bring the accommodation into the 21st century. And best of all, the site is incredibly family-friendly, with play areas and games for the children and home cooked meals, wine tasting and babysitting on tap for parents. Everyone’s happy! Gurat is small but well-equipped, with a 10th Century Gallo-Roman church, two bars, a post office and a petrol station. 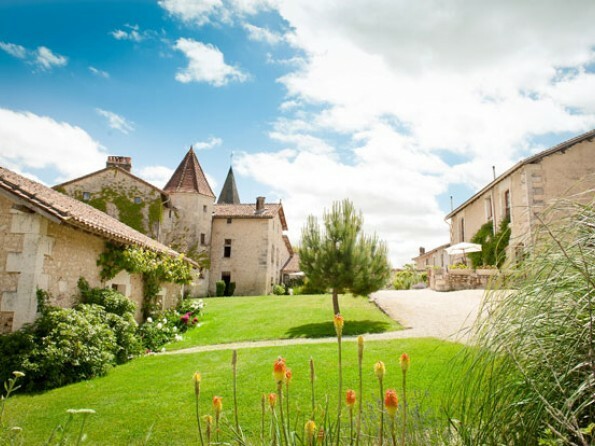 And the location of the village is unbeatable, nestled between Villebois-Lavalette (with its magnificent fortified hilltop Chateau) and Aubeterre-sur-Dronne, officially one of the most beautiful villages in France. There is a huge amount to do in the local area and beyond, whether you want to throw yourself into a range of outdoor activities or just wander lazily round vineyards and markets. Nearby there are opportunities for fishing, tennis, football, kayaking and go-karting, not to mention walking, mountain biking, golfing, bird watching, paragliding and horse riding. There is a water park just 20 minutes away in Augouleme, Aubeterre has a lovely (and well-equipped) river beach, and regional towns like Cognac, St Emilion, Brantome, Poitiers and Royan are well worth the trip. The nearest ferry port is St Malo, about a 6 hour drive away, and by air the nearest airports are Bergerac and Limoges. If you want to come by train the TGV goes direct from St Pancras (change at either Paris or Lille) to Angouleme (20 minutes north of the Chateau). From here you can easily hire a car. 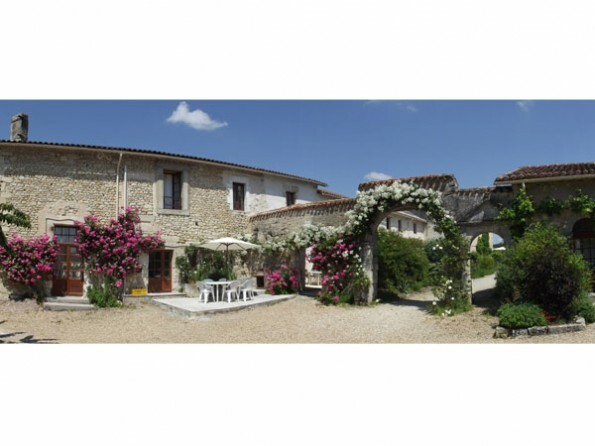 The six gites vary in size and style but they all have the same facilities. 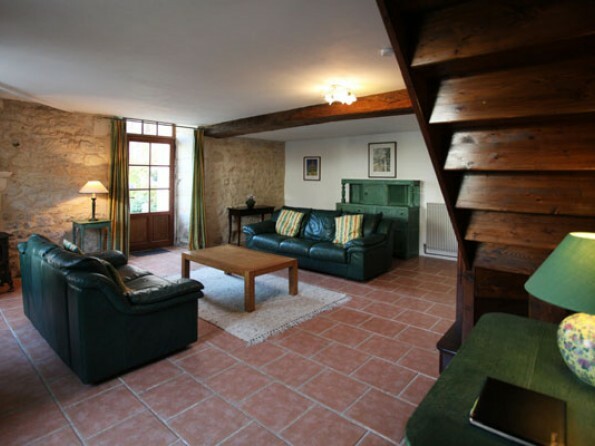 The Petit Chateau has three bedrooms and is perhaps the most luxurious of all the cottages, with a farmhouse kitchen and a large lounge kitted out with leather and oak. 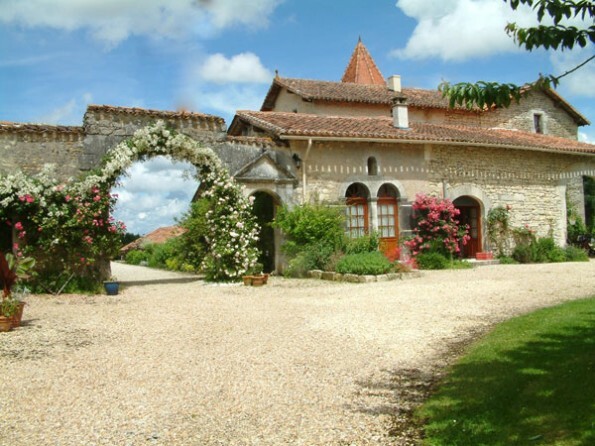 L’Etable, with its lovely views, and Le Coin Fleuri, with its rose-covered walls, also have three bedrooms. 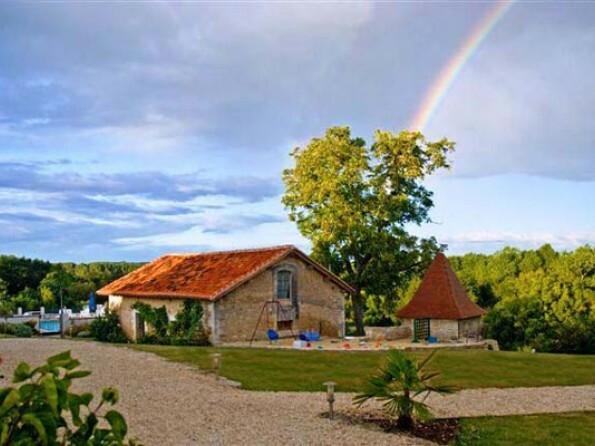 La Forge, with four bedrooms and stunning panoramic views, is the largest of the gites and is perfect for big groups, whereas Jardin de Rose, with just two bedrooms, is secluded and very romantic. 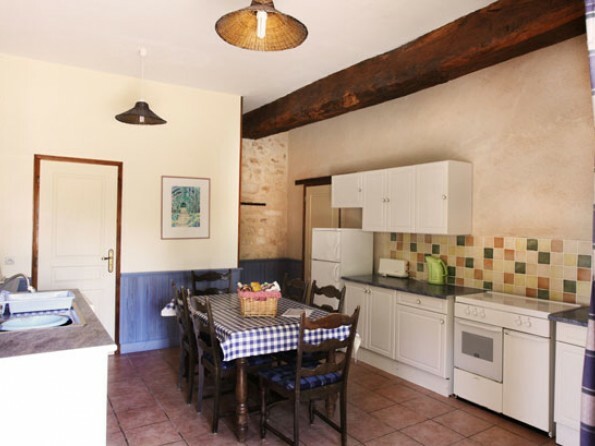 Le Mas Provencal also has two bedrooms and is good for smaller families. 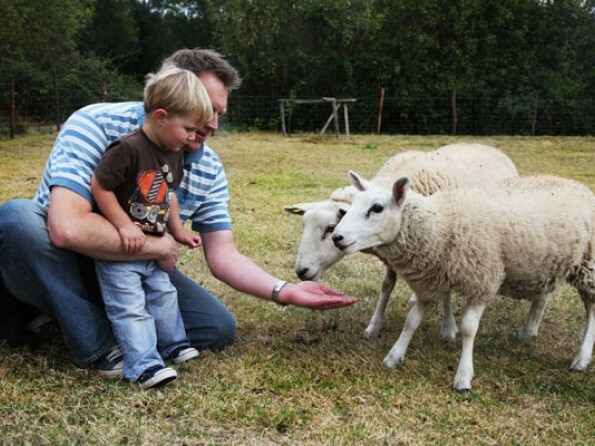 All cottages have private terraces with dining furniture and BBQs and the chateau sits within 14 acres of meadows and woodland so there is heaps of space in which for little ones and adults alike to run around and explore. Within the grounds there is an enclosed heated swimming pool, a smaller children’s paddling pool and a play area with climbing frame, trampoline, swings etc. And in the Bergerie you will find table tennis, table football, jigsaws, books and a mine of local information. Towels are not provided but are available for a small charge. The pool is open from mid-April to the end of September. All gite prices are per week from Saturday 4pm to Saturday 10am. Minimum 2 week booking from 2nd half July to 23rd August. A deposit of 25% is payable on booking and the balance is due 10 weeks prior to the start of your holiday.